With her sights set on the C-suite, Cynthia Pierre hopes to inspire the next generation of leaders. 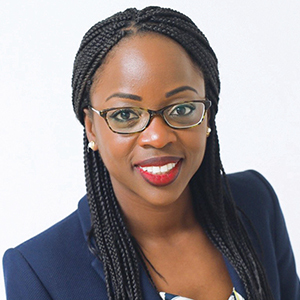 If you only went by what she wrote in her high school yearbook, you’d think Cynthia Pierre’s (PhD ’09) life has followed a clearly defined path. It was there that her teenage self laid out a singular plan: become an industrial chemical engineer. After getting her PhD in materials science and engineering at Northwestern Engineering in 2009, that is exactly what she did. But as a young girl growing up in Miami, Florida, the daughter of Haitian immigrants who did not attend college, Pierre could not imagine such a future for herself. Fortunately, a high school physics teacher saw Pierre’s innate talent for science and nominated her for a NASA Summer High School Apprenticeship Research Program, an eight-week program that drew high school students from across the country to conduct research at NASA facilities and universities. There, she began to understand what engineering was. After earning a chemical engineering degree from Princeton University, Pierre began graduate study in the lab of John Torkelson, Walter P. Murphy Professor of Chemical and Biological Engineering and Materials Science and Engineering in the McCormick School of Engineering. For her work on solid-state shear pulverization, Pierre received the Dow Sustainability Innovation Student Challenge Award, given to students who offer sustainable solutions to the world’s most pressing environmental problems. After completing her PhD, she spent five years at Dow Chemical in Midland, Michigan, synthesizing polymers for semiconductors, developing biorenewable cleaning agents, and creating new dispersants for heavy-duty engine oils. While there, she garnered four patents. Though Pierre found the work at Dow collaborative and interesting, when she learned about BP’s Future Leaders Programme, a four-year program to develop promising young professionals, she knew it was her chance to take her career to the next level and work abroad. Her involvement with Future Leaders led to a stint at a refinery in Western Australia and ultimately to her current position as inspection, materials, corrosion, and engineering superintendent at BP’s refinery in Cherry Point, Washington. Many would say Pierre has already done that. She spends much of her time mentoring STEM students and serves on Northwestern’s Materials Science and Engineering Advisory Board. She even inspires others through her mother, who tells the guests at the hotel where she works all about her successful, world-traveling daughter.